Readers of “Catch the Sun: Ballooning Across the Globe” will be able to use their NFC phone and the tags embedded throughout the book to access movie clips, download music, share to social media and even add their own content. Elektor International Media has published a book which includes “fully integrated” NFC technology — believed to be a world first — with eight tags embedded inside each copy to allow access to multimedia content designed to complement the book. 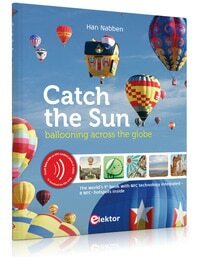 Catch the Sun: Ballooning Across the Globe will be published in October and launched in Albuquerque, New Mexico at the world’s largest ballooning festival. The US$57.50 book also comes with two NFC tags that have not been programmed yet. “Readers can program these tags themselves with the help of their NFC enabled smartphone and an NFC writer app, and thus add web links and content to the book,” says Elektor. Author Han Nabben is a licensed balloon pilot and, by day, a senior marketer at NFC chip maker NXP. The tags used in the project were supplied by NXP and Identive, and a set of QR codes is printed at the back of the book for readers who don’t have an NFC phone.